When I opened the front door feeling its damp moisture on my hand, I momentarily found myself dizzy and blinded by the darkness of the earthen floor in contrast to the brightness of the outside. Lit by the light of the hearth, the curled up figure that had just spoken appeared from behind the shoji screen stained in soot. Sat at the edge of the hearth with her legs stretched out, she hooks the fibers around the thumbs of her feet, handling and twisting them between her thumb and index finger with a certain air of ease without making any knots, gradually transferring them into the basket placed beside her. This is what is referred to as umu (spinning). As I continue to watch, her hands moved swiftly, almost as if she had eyes on her fingertips. She gave the impression of a silkworm that spews thread to make its cocoon. It was then that her partner Shintaro who sat wrapped in a futon said, “I see he’s come many times in the snow to speak to me. Why don’t you get involved for once?” Thus with these words, a wisteria weaving workshop had begun under the guidance and by following the example of Tame Mitsuno and Tsuya Ogawa (1985). 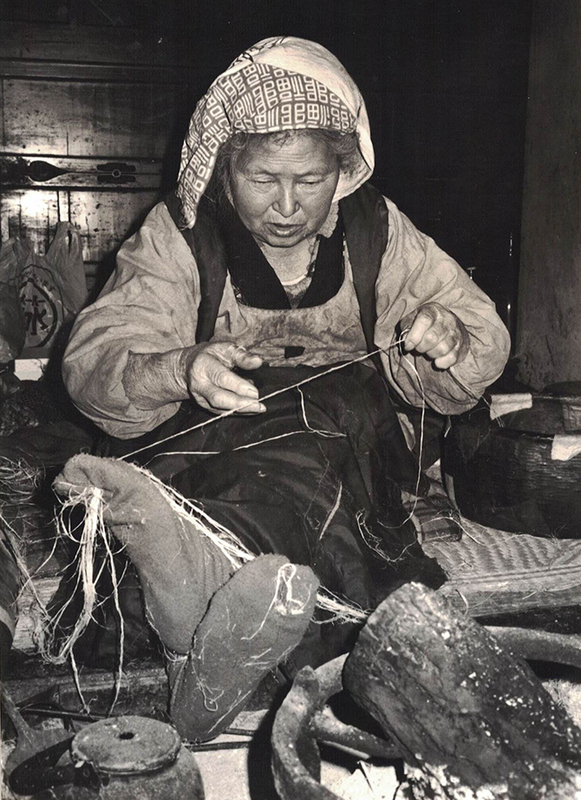 The women who engaged in wisteria weaving were of old age, and due to fear of being unable to pass on their techniques to future generations, it was decided that a documentary video would be filmed (1987). At the time there had been a request from the textile wholesaler “Shuuiki” in Kyoto to produce a fabric with a width of 45cm that could be used to make floor cushions for a tearoom. 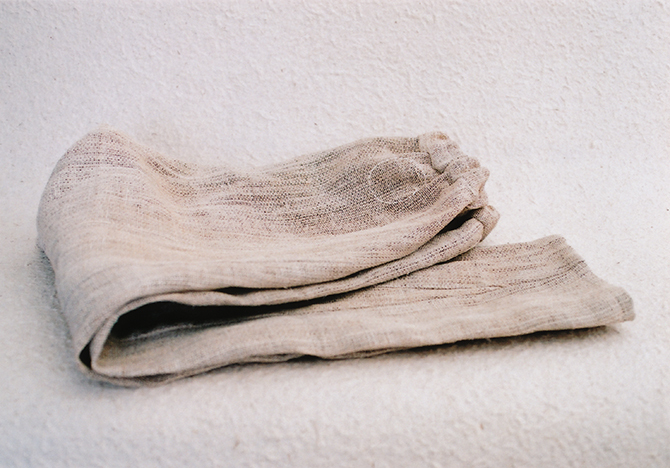 In filming the video we asked the women to return to the traditional method and weave the fabric at a width of 35cm. Tame-san who was the central figure had suggested, “Since I’d feel more in spirits, how about weaving two rolls of cloth rather than one?” She further proposed to me that I purchase these two rolls (320,000 yen worth in total: 1 roll = 150,000 yen x 2 rolls + what she had began weaving and had just finished weaving). Of course, this was a natural request. Having only just started working at the museum at the time, I had considered purchasing the cloth on part of the museum. Nevertheless I was unable to incorporate the fee within the museum’s budget, and telling myself that ultimately I would be able to preserve the actual cloth along with the documented video, I took the leap and decided to make the purchase. And now, I have asked Yukinori Maeda to tailor this cloth into a ‘tattsuke.’ Once the snow has melted I’d like to wear my tattsukeand go out to work in the fields. Hakuji Kashihate wrapped in the dew of Hisui. 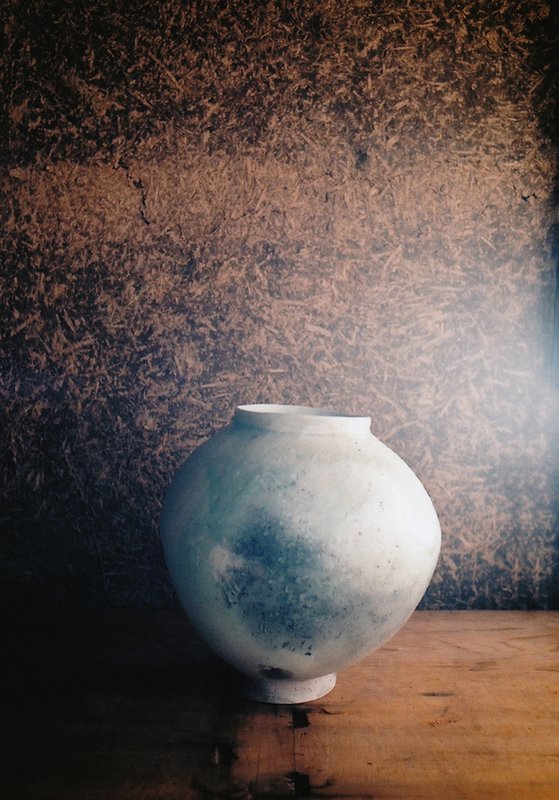 Following “The ceramics” of the last year, we are pleased to present Shigeo Tanaka’s “Hisui Kashihate” exhibition at Center for COSMIC WONDER. He live an old house of 280 years old in Asuka village, Nara Prefecture, maiking from a Hole type kiln “Rikei gama” and “Touen-shiki Takigama”. 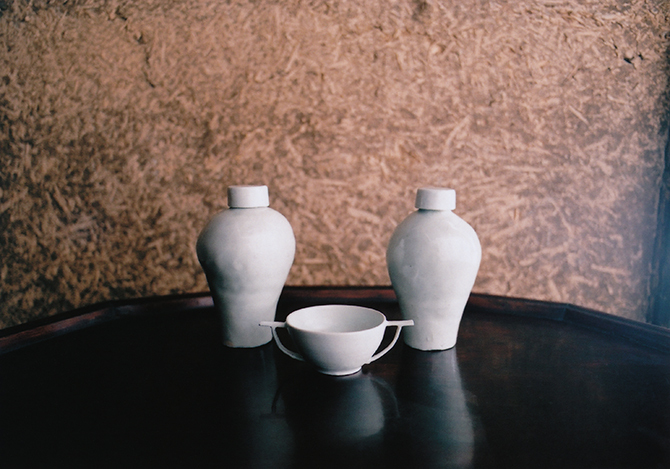 We will present “Kashihate” wishes of Shigeo Tanaka’s action on divinity and spirituality. Saryo Biwa”Ryugu Kashihate” of Nao Uekusa opens at Center for COSMIC WONDER only for day. Number of seats: 4 in each time / Reached the fixed number. Apply in e-mail. Send your name, telephone number to the following address.